We are listing below some of the most frequently asked questions and answers, however, should you have additional questions, please do not hesitate to contact us directly at sales@sunshinesgelato.com. Do you display your product at a retail location? Yes, all of our products are available at our retail location in Milton, ON. How fresh is your product? Our gelato is made fresh daily specifically for the customer/venue we are catering to using only the freshest of ingredients. Whenever possible, we use locally grown produce. Our retail location is open most days from 12pm to 9pm (seasonal), please call for confirmation. As for our catering business, we are available during the week or weekend, day or evening; simply let us know your date and time requirements and we will work to make one of our carts available to you! Is there a particular area or region in which you display your catering carts? As our production facility is located in Milton, we try to cater to locations within a one hour radius in order to ensure the best possible product for our customers. Gelato is a low fat form of ice cream. Normal American style ice cream contains between 10 to 20% milk fat where gelato only contains between 4 and 8%. It also has a lower sugar content and contains less than half of the air content. This provides for a lower fat, lighter, more flavourful frozen desert. Does gelato mean your desserts contain gelatin? Absolutely not, the term gelato is Italian for frozen. What options do you have for serving the gelato? 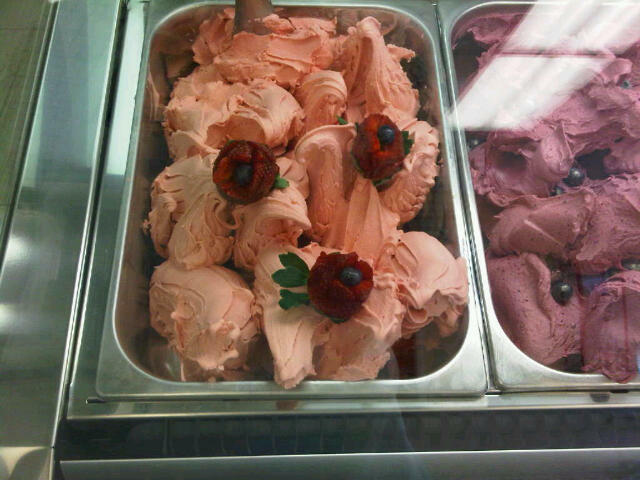 Our gelato is served either on a cone or in a cup. All of the gelato is served using either recyclable or biodegradable containers and utensils. Do you abide by local food safety requirements? Our production facility is regularly inspected by local food inspectors, all of our carts meet or exceed local safety requirements and our cart servers have completed the Food Handler Certification Program as delivered by the City of Toronto; all of this to ensure the products we serve are completely safe for you and your family to enjoy. 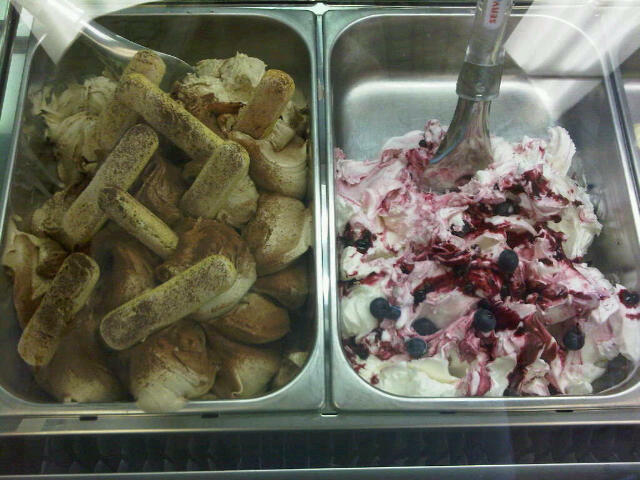 Tiramisu and Very Berry gelato!